I know why I am hosting this series of craft room tours now y’all. I love love love it! I love seeing how other bloggers organize their craft areas. How they have them decorated. How they make their space functional. I am having a blast this week and I hope you are too. If you have missed any of the fun start with my craft room tour then move on to the tours from day 1. Now for the craft room tours from day 2. First on the agenda today is Jessica from Mad in Crafts. I love her bright and colorful craft room. 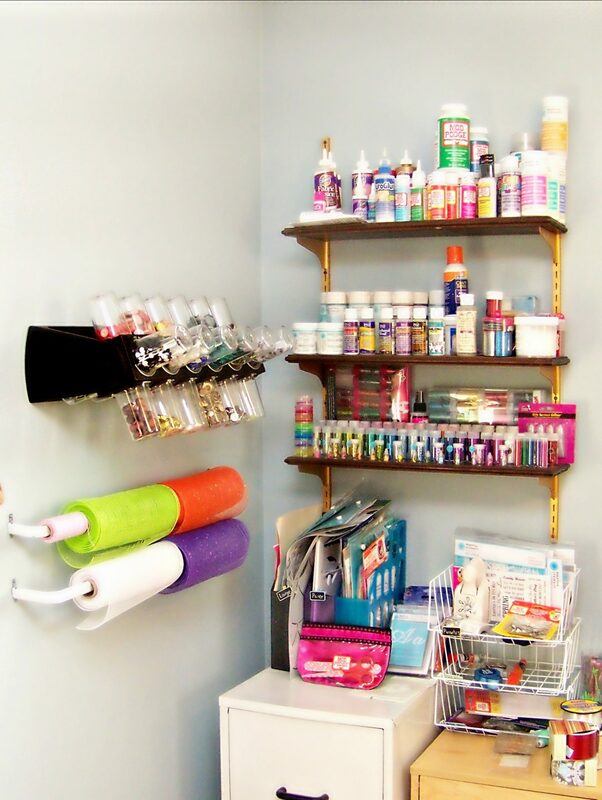 Plus she has some brilliant ideas for craft supply organization. You will just have to click over to see her amazing hanging paint racks in action. Plus her bright pink desk will blow your mind! Click her to see the entire craft room tour for Mad in Crafts. Up next is Carolina from Always Expect Moore. Carolina is a quilter and she has SO MUCH FABRIC! I die. Y’all really need to see her fabric stash. You also need to see how she uses everything from a dining room table to an Ikea shelving unit in this space. If you are a quilter or even if you are not, be sure to click over to see the crafty work room from Always Expect Moore. 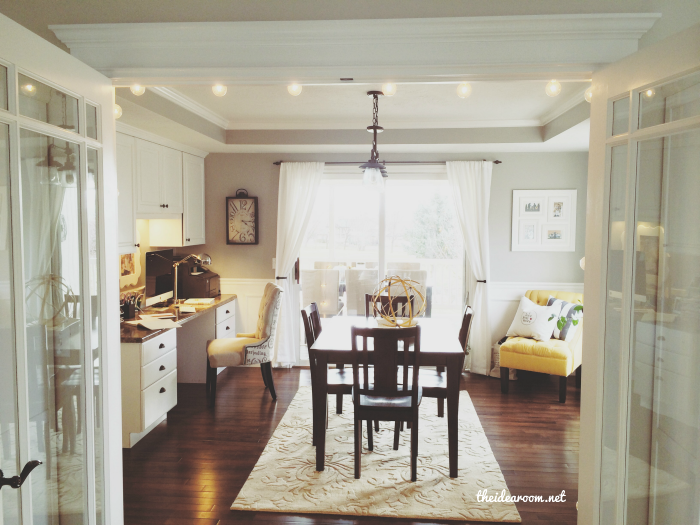 Do you need a take your breath away craft room and office? Amy from The Idea Room has us covered. So light airy and gorgeous. There is great functional storage plus gorgeous decor that I could just pick up and bring home with me. Think I could sneak in here and at least get that yellow chair? And you really must see the yellow apothecary cabinet Amy built for some of her supplies. To. Die. For. Click here to see more of Amy’s space and swoon along with me. Up next is fabulous designer and artist Carla Schauer. Carla has a gorgeous craft studio that I am in love with. I mean look at all of that counter space? Can you imagine having that much room to create? Plus the organization is amazing. 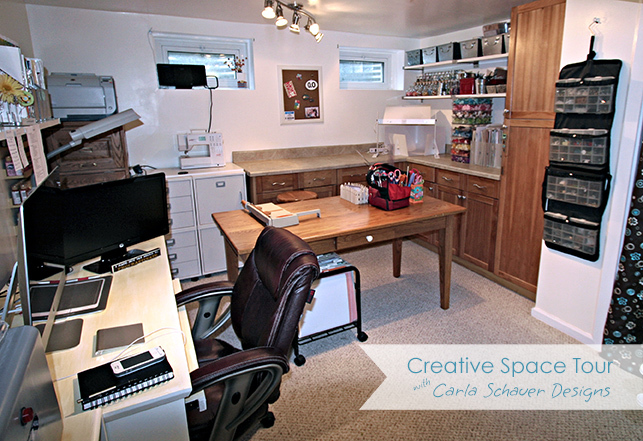 Be sure to click over and see the entire creative space of Carla. Oh my these rooms of seamstresses are making me want to get sewing. Take a look a the craft room tour of Sara from Major Hoff Takes a Wife. 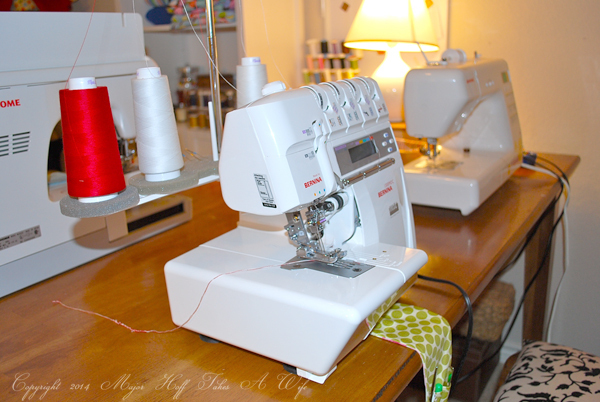 All of those sewing machines….I would love to get crafty with Sara for the afternoon wouldn’t you? Be sure to check out the rest of the tour as there is so much more to see in Sara’s craft room. More swooning? Check. 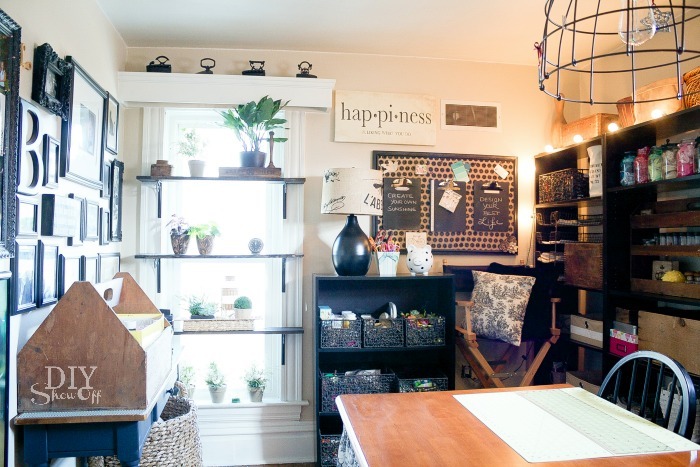 Roeshel from The DIY Show Off has the crafty work room of my dreams. She mixes new and old perfectly into an eclectic room that is inspiring and organized. I am not even sure I can pick a favorite part. That light fixture? Those shelves over the window? The mason jar craft storage? Yep all of the above and more. Click here to check out the entire work room of The DIY Show Off. Our last creative area for today comes from Niki of Homemadeville. Niki’s craft room is actually a closet which I love. No matter if you have an entire room or a little nook — you do have room to have a craft room of your own. Let Niki inspire you to carve out a crafting nook of your very own and make it gorgeous to boot. 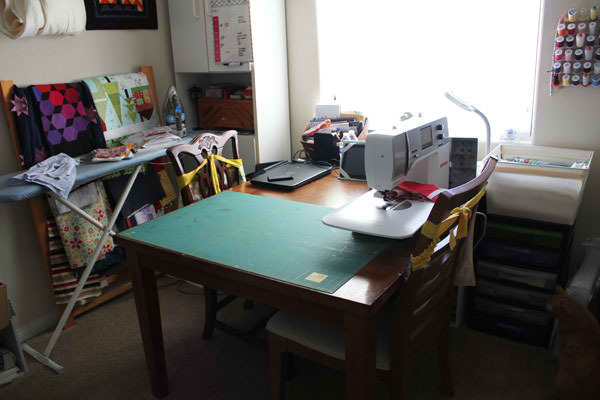 Click here to get the full tour of Niki’s craft area. Amazing craft room tours today right? I am in awe of all of the talent we have had so far this week. Y’all stay tuned as I have lined up an entire week of these amazing craft room tours. Follow along right here and don’t miss a bit of the action. If you get lost on the tour, just hop over to my craft room tour where all of the days will be linked for you. Thank you so much for having me be a part of your fun series! I LOVE seeing everyone’s creative spaces. So much inspiration and fun! I love all these tours, fun to see how everyone creates! I loved being part of this tour! So much fun to see how others work and what inspires them. How big was the office that you renovated? Which one are you asking about Brandy?